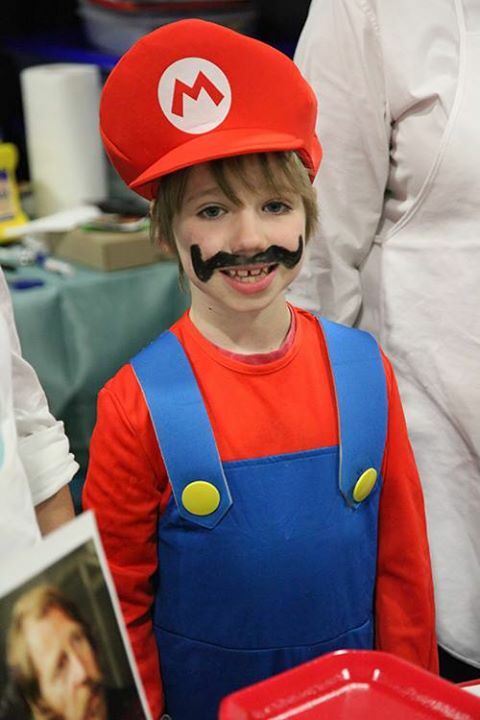 Pop Expo was very different for me. It was my first step into helping Chrissy with Cici & Co. and I wasn't really sure what to expect. I don't think she did either. On the morning of day 1 of 2, I was dropped off at the convention centre, helped her set up and we proceeded to go through the day with surprises, a metric ton of laughter, sold out treats, some that didn't sell at all because they were "too pretty to eat", incredibly sore feet, a van that made horrific noises on the way home and a late night trip across town to her house to help her bake and prepare for the next morning. 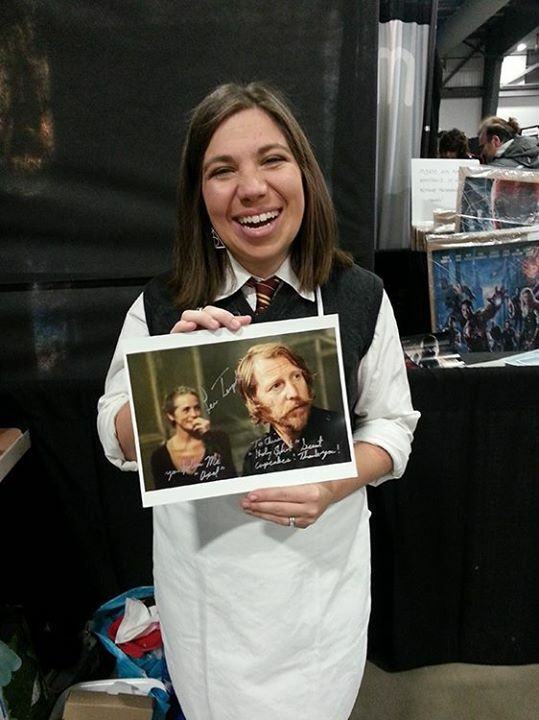 Some surprises of the day: meeting Lew Temple from the Walking Dead. We were just wrapping up our set-up when he walked by. 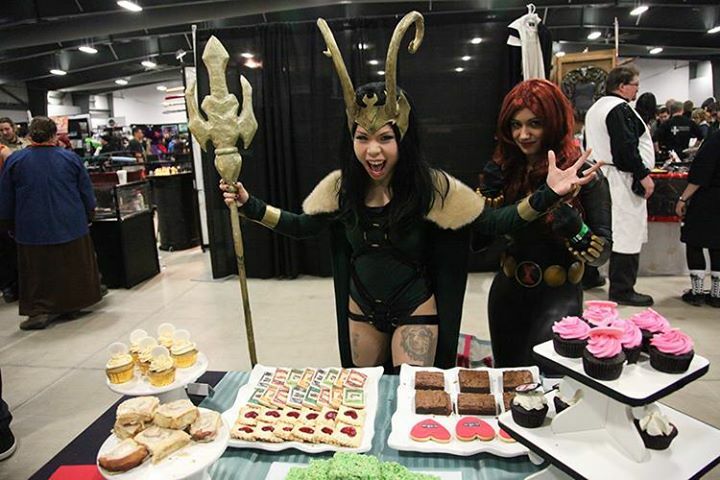 He was amazed by the booth and that there were cupcakes! He chatted us up about him being a celebrity judge on the CupCake Wars before heading off to his booth. 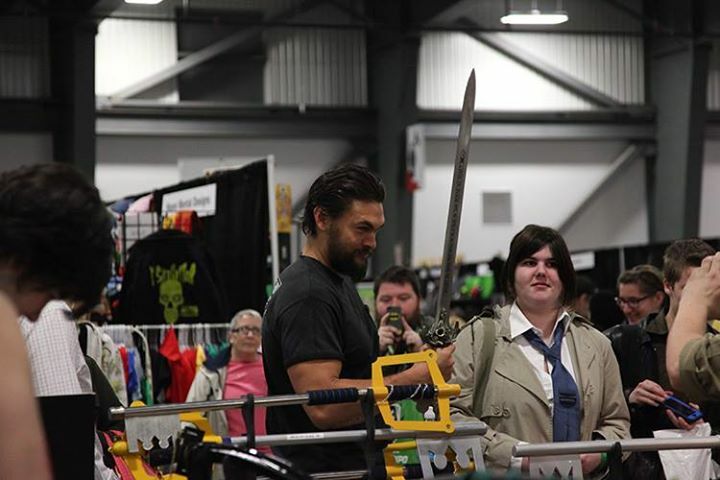 Our initial reaction to him was "OMG THIS IS SOMEONE OFF THE WALKING DEAD!! WHO IS THIS GUY?!" as both of us at the time (well me still, I haven't seen any of it) were new to watching it. After the shock wore off, Chrissy delivered him a cupcake which in returned he signed a lovely photo for her. It read "Holy Sh*t, Great Cupcakes! Thank You!". 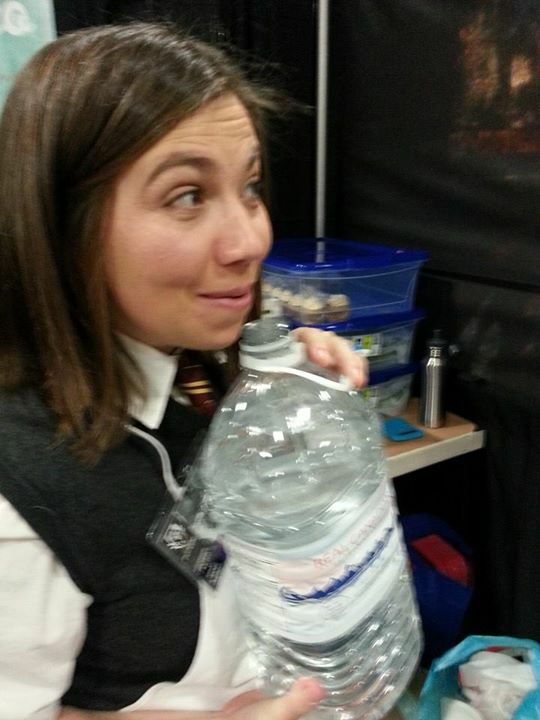 Another surprise of the day was Jason Momoa walking by to check out the weaponry booth across the isle from us, resulting in Chrissy nearly doing a spit take with her giant bottle of water she was drinking out of. Day 2 of the Expo was Loosh and I attending. 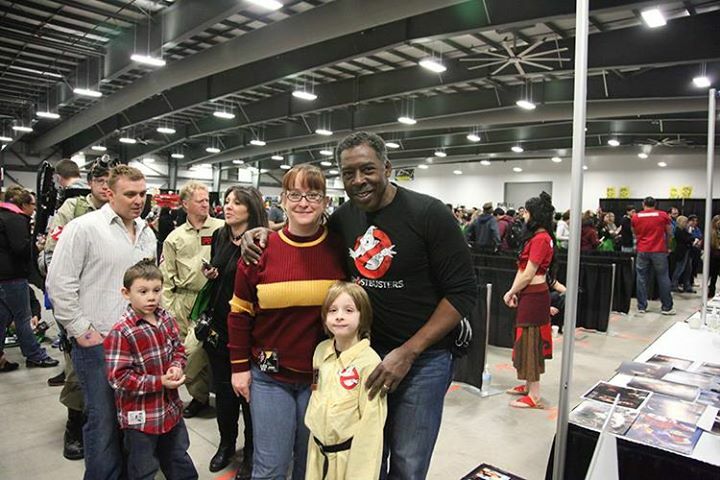 I wore a Gryffindor Quidditch sweater, Loosh was wearing a Ghostbusters uniform. On tap for the day? 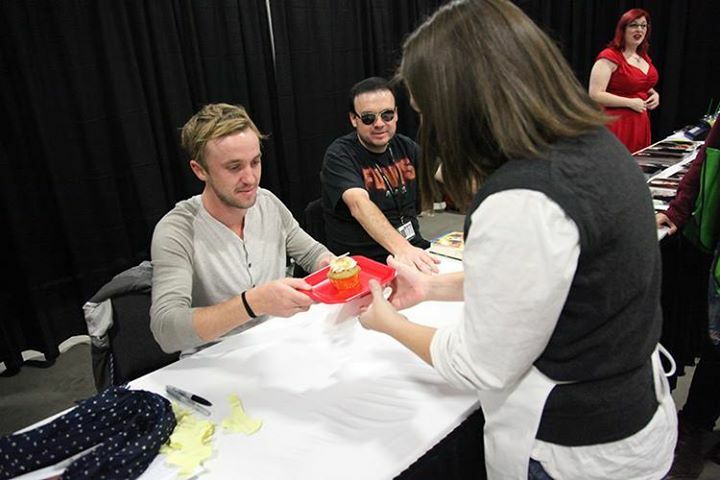 Meeting Tom Felton from the Harry Potter movies & Ernie Hudson from Ghostbusters. Getting into the hall, I noticed Chrissy was not there yet and felt a bit panicked. The Expo was open! Where was she? I sent out a frantic text to her and then proceeded to set up the booth for the day with the plates and stands so all she had to do was fill with product when she arrived. Turns out, the horrible noises from the van the night before were the sounds of her brakes seizing. They arrived while we were waiting in line for Tom Felton and I was able to breathe a bit easier. We took our turn through the line for Tom's autograph. 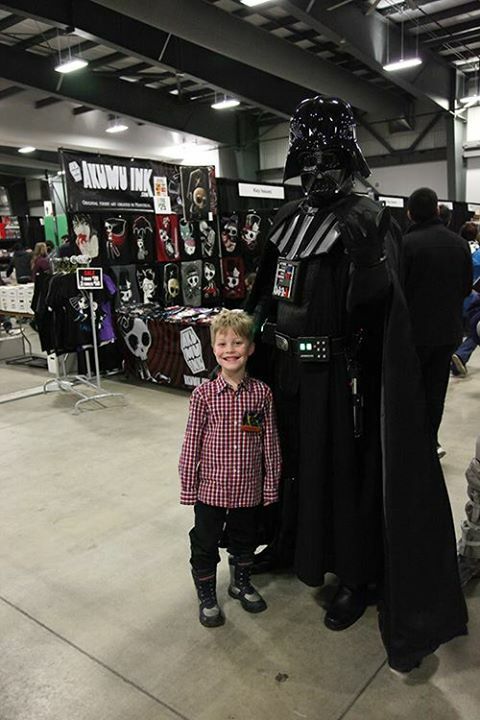 He asked what my plans were for the Expo, I mentioned we were here that day to see him and Ernie and possibly help out with the booth. He was all CUPCAKES?! I mentioned yes! 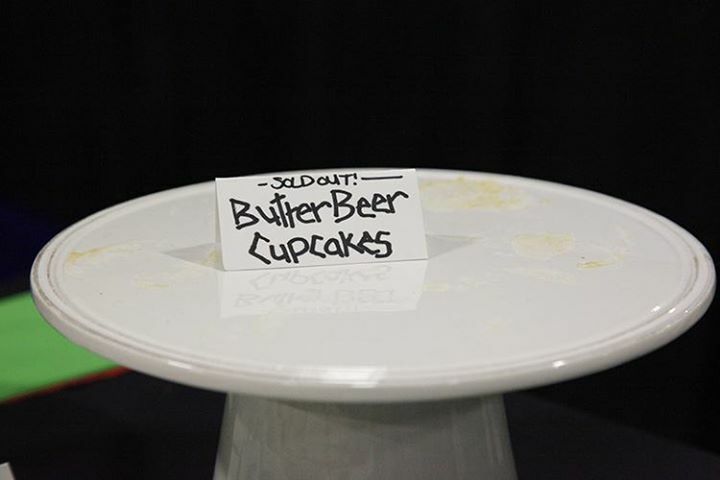 we have cupcakes and there was even a butterbeer flavour. He said he wanted one and I let him know I'd see what I could do. 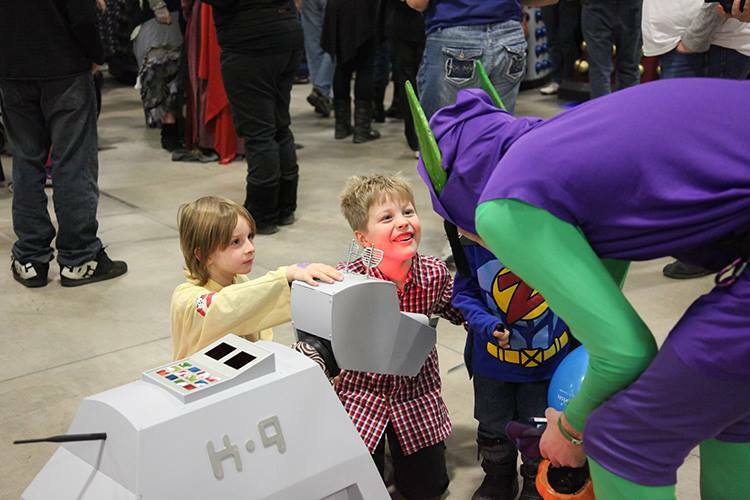 He chatted with Loosh about the books and movies. Loosh said that he had read all of them with Kev at bedtime over the past year and that he loved the movies. The cutest part was when talking about the last movie, he busts out with this "I have to tell you though Mr. Felton, the last movie was REALLY scary", to which Tom got this sweet "awww" face on, leaned in close over the table and told Loosh "It's ok, I thought it was really scary too!". Then our time was over. 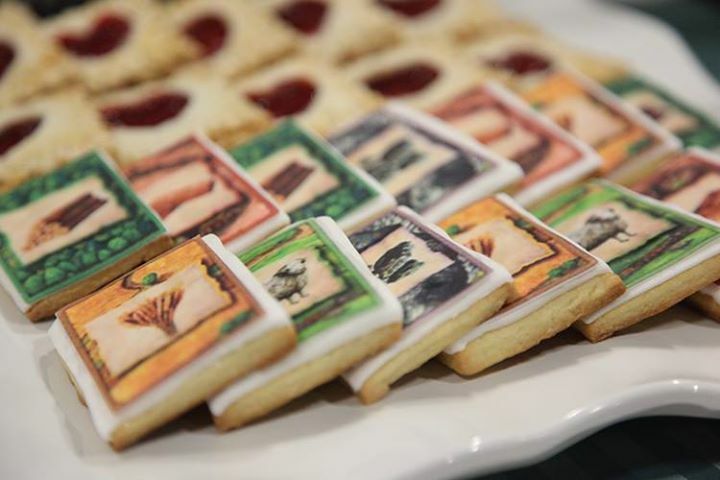 We left the signing area and made a beeline straight to the booth, in which I barked at Chrissy to get a Slytherin cupcake set up on a plate with a napkin, she had a date *L* We were able to scoot back in line and she presented him with his cupcake, he signed her book for her as well which was nice. After that, Loosh and I walked around and did a bit of shopping. 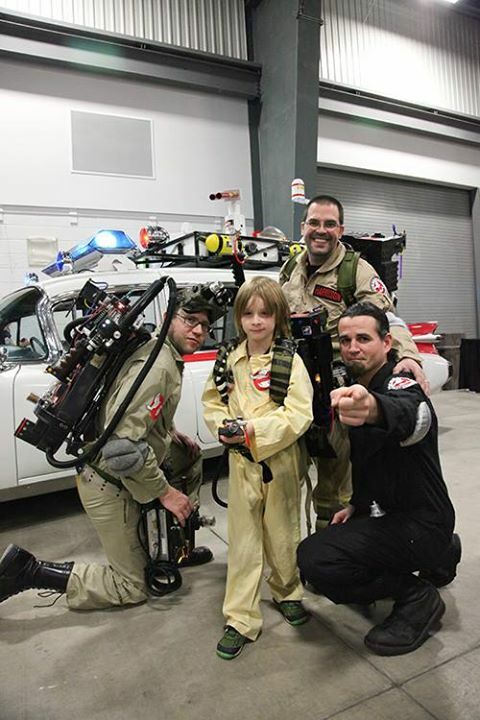 At the Expo, were the Montreal Ghostbusters and they had their replica car of Ecto-1. 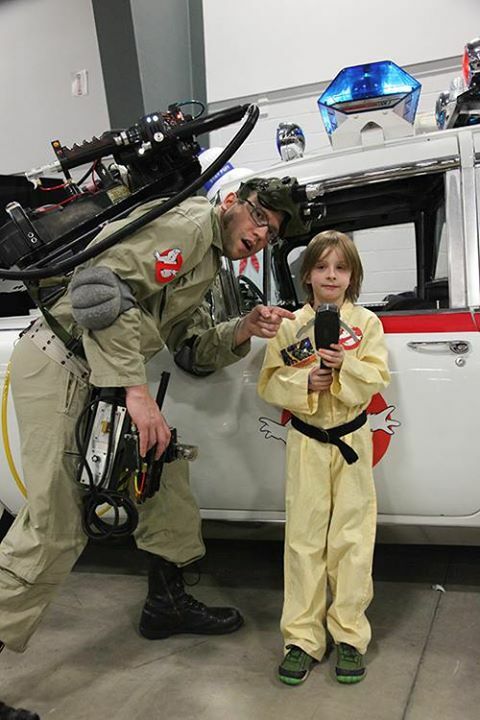 They were completely taken with Loosh in his mini-uniform and spent a good 45 minutes showing him all the parts of the car, the proton packs, talked about how they built them, turning the car sirens on, letting him sit in it for photos. 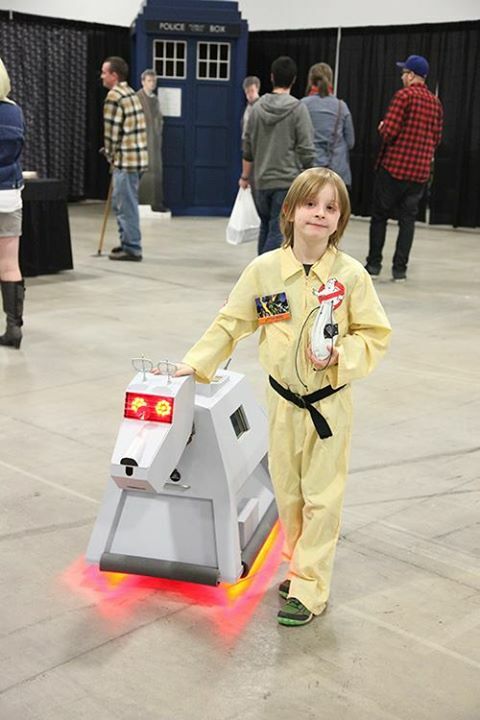 They're good guys, raising money for different charities in Montreal. 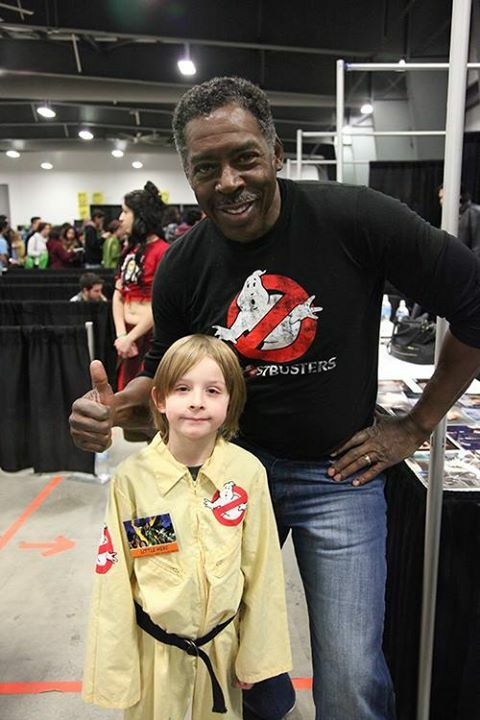 After visiting with them, it was time to go see Ernie Hudson. A super lovely guy that spent several minutes talking with Loosh about the movies, which scenes were his favourites or which were scariest. Loosh asked him how gross the pink slime was in the second movie because it looked like boogers. Erine signed a nice photo for him and the asked if we wanted a couple of photos. Wasn't going to turn that down! During our shopping time, we found some friends! Chrissy's husband had brought the kids in to check things out. So we were able to see C for a bit. Then Julia & Erik arrived, we wandered with them. 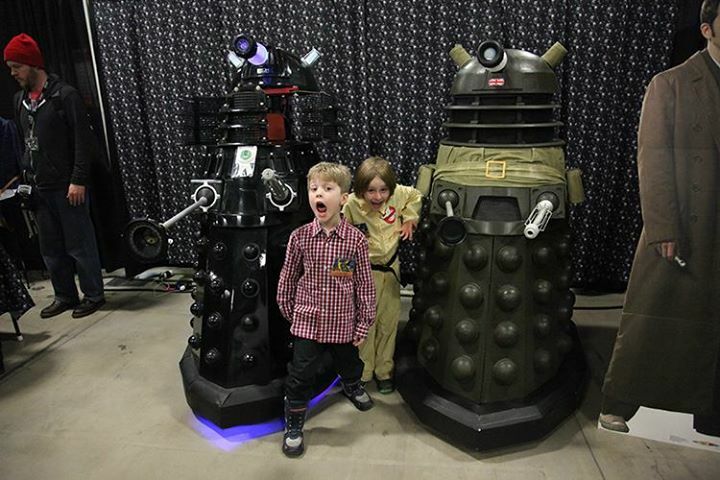 The boys naturally gravitated to the Doctor Who exhibits. Erik was more familiar with the show but Loosh was definitely getting more interested in it. 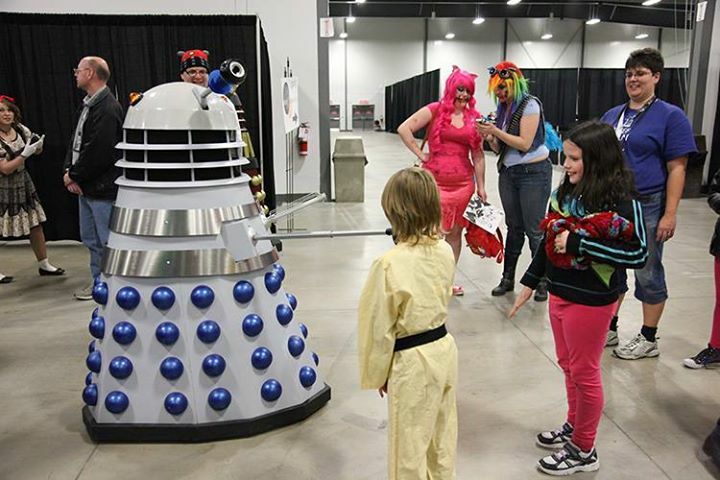 I knew the time of watching was upon us -lol- While hanging around the Doctor Who Society of Canada's area, the Daleks were out interacting with Expo patrons. 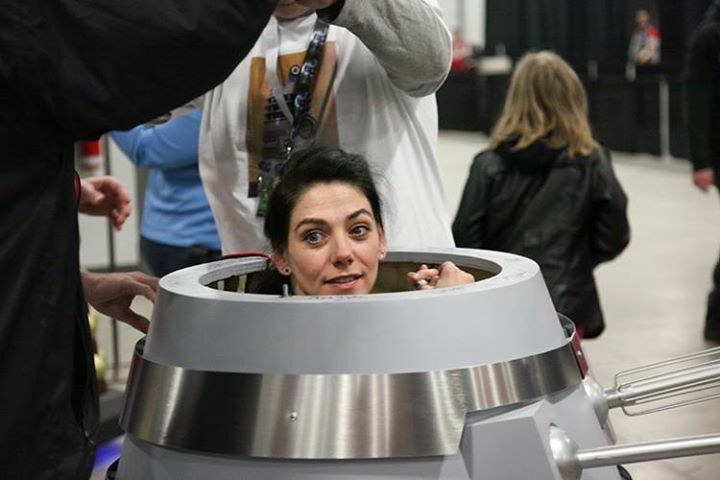 One was being particularly friendly high fives all around- turns out it was Neve McIntosh from Doctor Who (she plays Madame Vastra) at the controls. Loosh also became extraordinarily attached to K-9 while we were there and we closed out our day with the promises of watching the Doctor on Netflix and yes, there would be K-9.